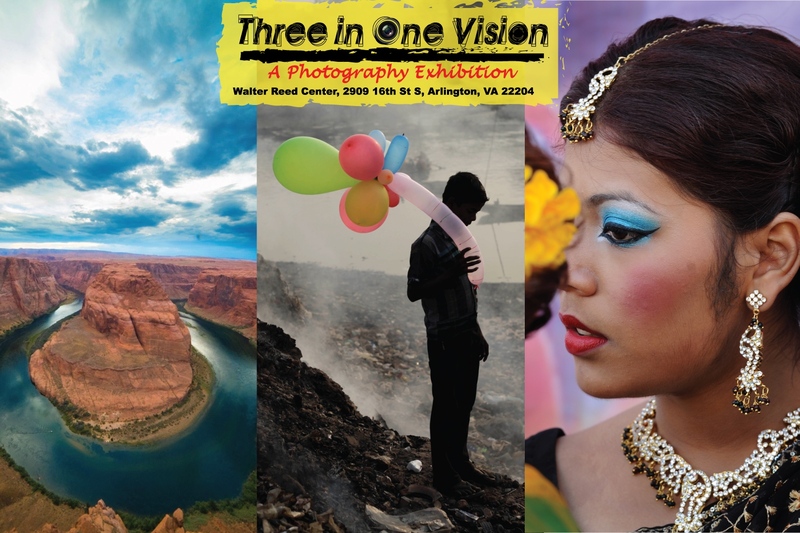 THREE IN ONE VISION A Photography Exhibition in Walter Reed Centre, Arlington, VA from April 27-29, 2018. Three in One Vision is an exhibition powerfully highlighting the sights, cultures and relationships of the United States of America and Diverse ethnicities. It features the exceptional work of three accomplished photographers: Lloyd Wolf, Andrew Biraj and Shibly Shiraj. Living Diversity: The Columbia Pike Documentary Project (CPDP) is a team of photographers that have captured the evolving life of the people and places that make up this historic corridor in Arlington, Virginia, immediately adjacent to Washington, DC, the nation’s capital. Five insightful photographers — Lloyd Wolf, Duy Tran, Xang Mimi Ho, Aleksandra Lagkueva, and Paula Endo — collaborated to document the essence of the place they call home. Some work in this exhibition was created as part of the Columbia Pike Documentary Project by its chief photographer, Lloyd Wolf. As part of the project’s mission to capture the cultural life of this exceptionally ethnically diverse neighborhood, he made images depicting the people and activities at the annual Prio Bangla Multi Cultural Festival, held each year along Columbia Pike since 2012. Prio Bangla is Virginia based Congressional Recognition award recipient non-profit organization whose primary mission is to help inhabitants of our diverse community. The Prio Bangla Multicultural Street festival celebrates ethnic culture in America in a vibrant and public way. It is a capstone event that features the people and vivid cultural expressions of the diverse community in America. It has deepened and celebrated the connections between the many ethnic groups living in this area. The photographer is happy and honored to share this work in collaboration with two accomplished Bangladeshi photographic artists, Mr. Shibly Shiraj and Mr. Andrew Biraj. The evocative photographs in this cross-cultural exhibition depict Mr. Biraj’s cutting-edge images of life in Bangladesh, Mr. Wolf’s colorful documentation of Bangladeshi festivals in America, and Mr. Shiraj’s gorgeous depictions of the American landscape. The three days long exhibition has been set with an extended hours in support of Arlington County Cultural Affairs, Arlington Arts, Columbia Pike Documentary Project with an active cooperation from Prio Bangla. You are invited to participate in this event to experience the photographic works as well as to meet the photographers in person. Audience will have flexibility to choose any of the three days to explore the photos, supporting the project, meet and greet photographers and discuss its mission and vision. Opening ceremony is scheduled to take place on Friday, April 27 in the evening- details coming soon. Arlington Video Network (AVN), Arlington Now, Arlington Independent Media, Sun Gazette News Paper are possible media partners for the project. Moments Multimedia Group (MMG), a Bangladeshi Photographers Alliance in Washington metro area, is the supporting group for this exhibition. Lloyd Wolf is an award-winning photographer and educator with work collected the Library of Congress, the Museum of Jewish Heritage, American University of Cairo, the Rosa Parks Museum, the W.E.B. DuBois Library at the University of Massachusetts, the Corcoran Museum of Art, the National Museum of Fine Arts in Hanoi, Vietnam, and numerous other institutions. His books include “Jewish Mothers: Strength Wisdom Compassion,” “Jewish Fathers: A Legacy of Love,” “Facing the Wall. Americans at the Vietnam Memorial,” and “Living Diversity: The Columbia Pike Documentary Project.” He worked on assignment for the Washington Post Magazine, People, Vogue, Elle, National Geographic Explorer, NIH, AFL-CIO, The US Census Bureau, the Folger Shakespeare Library, Newsday, and many other clients. He has taught at Shepherd College, George Mason University, and to homeless and immigrant youth. His work has been exhibited in over 100 national and international exhibitions. Shibly Shiraj bought his first DSLR camera in 2014. He has always loved to travel. For him, a DSLR camera and traveling was a perfect marriage. He couldn’t stop taking pictures of the beautiful landscapes he encountered in his journeys around the world. He traveled to many of the National and State Parks across the United States, creating images of the exceptional scenery he observed there. Part of his travel besides USA he has so far visited and taken pictures from beautiful places like Japan, Iceland, Canada, Mexico, Turkish, Dubai, Bangladesh, India, United Kingdom, Nepal and many more places. This exhibition consists of his photographs of the American landscape. This is his first photo exhibition.